Japanese Episode DP 021: "The Strongest Koiking and the Most Beautiful Hinbass!" American Episode 485: "Ya See We Want An Evolution!" On the way to Sono'o Town, our heroes pass through Kotobuki City once again. As they enter the town, they are greeted by a news reporter who tells them of a group called the B-Button League. 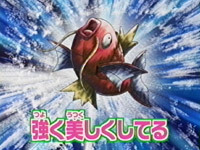 The league is a group of Coordinators who train their pokemon to become stronger without evolving, and their signature pokemon are a strong Koiking and a beautiful Hinbass. Satoshi and his friends visit the league headquarters and are greeted by two of its members, Hatsune and Otone. After exchanging a few pleasantries, Hikari challenges Hatsune to a pokemon battle. The battle is conducted in a giant pool that allows Hatsune's Koiking to show off how swiftly it can swim, and before long, Koiking KO's Hikari's Potchama without taking any damage! Satoshi is the next one up, so he chooses his Pikachu to battle the fish pokemon. Koiking is able to dodge all of Pikachu's electric attacks before launching a Tackle attack that ends the battle in a stalemate. At that time, the Rocket-Dan, disguised as members of an imaginary group called the C-Button League, kidnap the fish pokemon and take it back to a cabin just outside town! When our heroes finally arrive on-site, they find Koiking being inserted into a giant evolution machine. The Rocket-Dan attempts to use the machine to force Koiking to evolve into Gyarados, but their attempts fail time after time. While the trio tries to figure out what went wrong, Pikachu uses its Iron Tail attack to destroy the machine. Afterwards, the newly freed Koiking and Hinbass join together to send the Rocket-Dan blasting off. Now that the pokemon have been returned to their trainers, Satoshi-tachi bid farewell to Hatsune and Otone, taking with them memories of the league members' unique training philosophies. When this episode came out in Japan, I remember that a collective "WTF?" was uttered by fans who couldn't figure out why the anime producers would make a filler episode about two weak fish pokemon from previous generations, especially this early in the series. Luckily, the inclusion of the B-Button League (or B-Button Alliance, depending on what translations you trust) helped them ease into the episode. The idea of a group of people (who apparently only has two members?) named after one of the geekier parts of the video games appealed to a lot of people, and the fact that they trained two of the most hated-by-gamers pokemon sparked some interest as well. The inclusion of the Koiking salesman, the Gundam, and the Wii remote (not "Wiimote," which is a fan-only term) also helped things out. If I had a gripe about the episode, it has to be the fact that Hinbass was almost completely ignored. We see why Hatsune's Koiking is considered to be the strongest, but what is it about Otone's Hinbass that earns the title "most beautiful?" I know this picture is an homage to some old anime or manga, but I can't for the life of me figure out which one. Do any of you guys know? I really wanted to strangle the people who edit the music for PUSA. You know that long piece of music we first heard back in "Twice Smitten, Once Shy! ", when the gang was chasing Pachirisu around before Dawn released it? It's played again during the scenes where Team Rocket's trying to make Magikarp evolve in this episode, and it's even more unfitting here than it was back then. PUSA, do you even listen to the show after you've "fixed" its soundtrack? Anyone with a working set of ears can tell you that the song clashes horribly with the animation on-screen, yet they used it anyway. 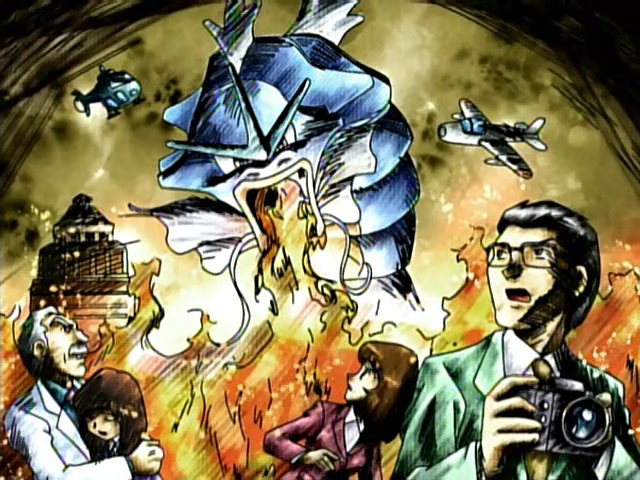 We also got PUSA's version of the Magikarp salesman, who really doesn't sound all that bad. It's a hell of a lot better than the Chronicles version, at least. Hinbass keeps its Japanese voice. Reporter: "Excuse me. We're from Jubilife's Sinnoh Today Show, and wanna know if you used anything mechanical to evolve that Pikachu of yours." Ash: "I wouldn't do that." In the Japanese version, the reporter asks Satoshi if his Pikachu evolved from a Pichu, to which Satoshi replies that it did not. It was a nice moment that kind of reminds the viewer of Satoshi's and Pikachu's first encounter, but it's lost in the dubbed version of the line. The TO BE CONTINUED screen. Three seconds. Can you guess the verb that should go there?